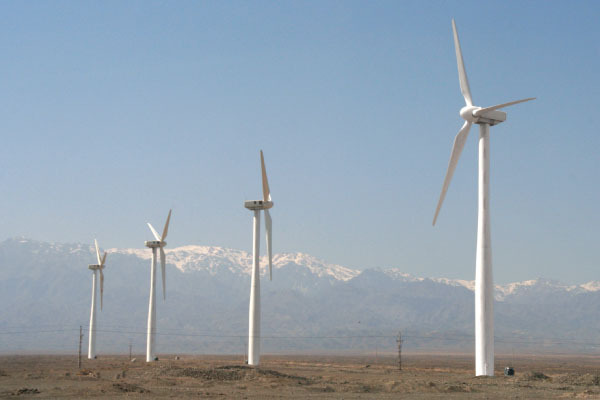 China is producing wind turbines, such as these in Xinjiang province, at a record pace. China may be the most polluting country in the world, but it’s putting some of that smoke and carbon output to good use by manufacturing renewable energy equipment. The country is producing wind turbines and solar panels at a world-record pace, according to Who’s Winning the Clean Energy Race 2010, a new report from The Pew Charitable Trusts. China’s private investment in clean energy soared in 2010, increasing by 39 percent over 2009 to $54.4 billion. China’s growth is a microcosm of broader global traction. The worldwide clean energy sector grew 30 percent from 2009 to $243 billion of finance and investment in technologies such as wind, solar, biofuel, and geothermal. But Asia is the region to watch. In 2010, its clean energy investment increased 33 percent over 2009 to $82.8 billion. In 2009, the region surpassed the Americas for the first time, and in 2010, investment grew faster than in Europe. The European region is still the leader in clean energy finance, with $94.4 billion in investments (mostly helped along by investments in small-scale distributed capacity projects, including rooftop solar panels), but Asia is quickly catching up.